Toyota Motor Corp unveiled a new Camry sedan for Japan on Monday, offering it only as a gasoline-electric model to jump-start sluggish sales of the model in its hybrid-friendly home market. The Camry has been the best-selling car in the United States for the last nine years, but Japan accounts for just 1 percent of the model's global sales due to shrinking demand for sedans in favor of subcompacts or minivans. For the first time since the Camry's debut in 1982, Toyota said it would limit sales in Japan to a hybrid version, hoping to emulate the success of the Prius, which as a hybrid car enjoys exemptions on certain taxes. Hybrids now make up about 14 percent of new vehicle sales in Japan, excluding 660cc minivehicles. "The Camry doesn't sell as much here as it does in the States, so we decided to focus on fuel economy," said deputy chief engineer Keiichi Yoneda. Toyota said it received 1,700 pre-sale orders for the car against a monthly sales target of 500 and actual sales of just 100 a month last year in Japan. 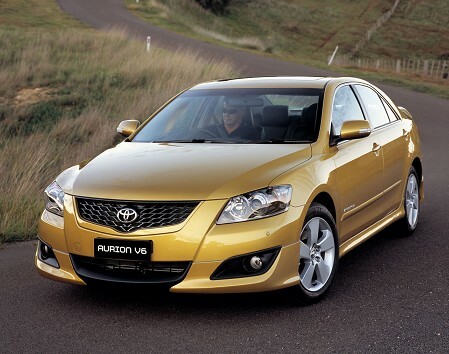 In the United States, by contrast, Toyota plans to sell 360,000 of the 2012 model year Camry unveiled last month. Pricing for the Camry hybrid, which twins a newly developed 2.5 liter engine with an electric motor, ranges from 3.04 million yen to 3.80 million yen ($39,600 to $49,500) in Japan. The U.S. version, which is slightly smaller, carries a sticker price of $27,400 for the high-end model. The hybrid Camry gets listed mileage of 23.4 km/liter in Japan, more than double the 11.4 km/l for the preceding gasoline model, which was measured under the previous, less stringent test cycle. The previous model ranged from 2.505 million yen to 3.47 million yen.